RUTLAND — On Sunday, Aug. 10, citizens banded together for a second time to hold a protest in front of Mac’s convenience store and gas station on South Main Street in Rutland. The group is encouraging folks to not spend their money at Mac’s locations until owner Jennifer Allen changes her policies to make a safer work environment and begins to treat her employees with basic respect and human decency. The boycott began after Don Pitianiello, age 58 of Rutland, thwarted a robbery at Mac’s convenience store at 145 North Main Street by drawing a gun on a knife-wielding robber Sunday night, June 15. He was subsequently suspended from his job as a clerk at the convenience store. Pitianiello said he had defended himself by using his legally concealed weapon while working as a cashier at Mac’s when he was robbed at knifepoint. No one was injured as the result of the incident, and the robber left the store without further incident. But Pitianiello was in violation of Mac’s policy of no firearms at work. Pitianiello expected to be reprimanded, he said, and he was not surprised to lose his job. But when he met with Jennifer Allen, the owner of the Rutland Mac’s, Allen proceeded to verbally vilify him and left him no choice but to quit, he said. This was his second job. He took it on to help with his family stay afloat with mounting medical bills due to his wife’s medical condition. Don Pitianiello is a Vietnam veteran. Locals formed the Facebook group “Boycotting Mac’s,” to support Pitianiello. The page now has a following of over 1,000 supporters. While it is against Mac’s policy for employees to carry firearms to work, that is not the issue at hand here, the protesters clarified. Pitianiello fully expected to be disciplined for violating policy, but it was the manner in which it was done that has raised concern with the townspeople. Since this incident happened, other former employees have come forward confirming similar experiences with Allen, which include verbal tirades and backhanded business tactics. Since the Facebook group has formed, according to the protesters Sunday, Allen has taken steps to track down members of the group and has threatened to stop doing business with any vendors who employ them — essentially blackmailing these companies to either infringe on their employees’ right to free speech or lose a business client, a member of the group who wished to remain anonymous told The Mountain Times. Allegedly, Allen also had a friend contact the Pitianiello’s new employer, The Rutland Country Store, encouraging them to fire him. The Rutland Country Store is aware of the incident and why Pitianiello was forced to leave left his previous job at Mac’s — in fact, that is part of why they hired him, some say. The group claims that Jennifer Allen has far overstepped common-sense boundaries. During the first protest, July 19, Allen lowered the price of gas and gave away free coffee to patrons to lure them into Mac’s in light of the boycott. She also had two deputies and a sheriff there, to the tune of $200 per officer, protesters reported. But this time, she went further. 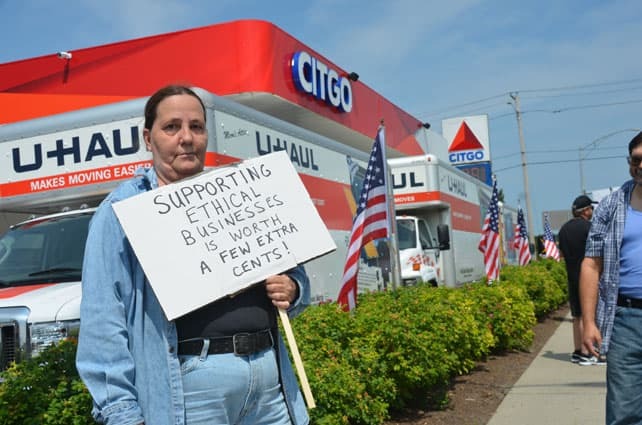 On Sunday, in addition to the No Trespass Order she has placed on Don Pitianiello (which is not the first No Trespass Order she has filed on past employees), Allen rented three U-Haul trucks and parked them along the roadside by her parking lot, blocking the view of protestors from her store. There were also new security cameras in place, but they were not in the store to protect her employees. Rather these new cameras were mounted above the gas pumps pointed at the sidewalk where the protest was held. A sound system also blasted loud music outside dur ing the hours the protest was held, making it hard to have a conversation with someone standing next to you. “Don’t you think that money would have been wiser spent on security cameras INSIDE the store, or on a second person on closing shifts so no employee has to be alone in the store late at night?” one protester asked. This time, folks came from as far as New Hampshire to support the boycott and bring awareness to the issue of employee rights, safe working conditions and rising crime in the Rutland area. John Burt, a candidate for State Representative in New Hampshire, came to show his support on Sunday, too. NHPR has coined Burt as “a hard-liner on Second Amendment rights.” But that wasn’t what motivated John Burt to attend the rally. “I don’t believe I am a hard-liner, but I do believe in the Second Amendment,” he said of his reputation. “Bottom line is: businesses have the right to make their own policies, but to get a No Trespass order… why?” Burt said, adding that in his opinion that was stepping over the bounds of store policy and infringing on individual rights. DePino is doing what he can to support Pitianiello’s cause: hitting Allen in the pocket book, he said. Will it make an impact? DePino’s household consists of three licensed drivers, all of whom have trucks. They each spend about $300 a month on gasoline, he said. $300 x 12 months adds up to $3,600 per year in sales that Allen has now lost, and that is just one family. “We have choices to exercise our right to spend money wherever we choose. It can have an impact,” said Bob DePino. He also mentioned he would not allow his granddaughter to take a job at a place where she was the sole person there. “It is not safe or fair to have an employee there alone,” he added. This story, like most, is multi-faceted, and the 1,000+ members of the Facebook group “Boycotting Mac’s,” likely have various reasons for supporting it, from the importance of safe work environments and ethical treatment, to second amendment rights. Join the conversation at mountaintimes.info. Ms. Allen is showing rabid disregard for ethical boundaries. Rutland can do better by its workforce. Turn up the heat. This is the BEST article I’ve read in a long time. EVerythin was said perfectly 🙂 beautiful job. I do understand that as a business owner you have the right to make certain decisions for the “good” of your company. What I strongly disagree with is the fact that “you” meaning many of you and other employers out there that think it’s ok to be demeaning and disrespectful to the people who work for you. No they are NOT beneath you and you certainly do not have the right to speak to anyone in such a demeaning manner. I see it over and over again. You can say, you don’t like it then leave it. Point taking….But as a person you think it’s ok to belittle someone because they are less fortunate than you or don’t have the education that you do? Come on this is 2014 haven’t we evolved more than this? Apparently we have not. Or You have not Ms. Allen. You care not about your employees but about your stores, insurance policies, and well your reputation?! I guess. I can’t respect that as there are too many of you out there. I pity the folks that really need a job and come to your store and you continue to talk to them as they are insignificant and will never matter to you as they come and go so frequently. I wonder why? Thanks Mountain Times for the courage and tenacity to stand by this unfortunate display of disrespect. I find myself asking the question, Why? Why not just treat an employee that defended themselves and your property with some level of respect and professionalism while enforcing your corporate policy. It costs nothing to treat people well. Why send him a no trespass order after the fact? Why contact members of the Facebook group Boycotting Macs! Employers and try to force them to stop sharing their opinions or be fired? You will never be successful trying to intimidate people to surrender their 4th Amendment Rights. Why would anyone have video cameras and a sound system professionally installed just to watch people protesting your unethical business practices? Surely that investment would have gone a long way if used to actually solve the issues at hand. Why, in light of already being boycotted would you encounter people around town and vilify them in public? Not going to make many friends that way. Why would you take a hit by losing over 1000+ customers just to avoid a public apology and a few bucks to safeguard the very people that are making you wealthy? Lots of questions, The answer most likely lies in the possibility that we are dealing with a full blown Narcissist / Elitist here, and if they don’t eventually see the writing on the wall, it probably won’t end well for them. Thank you Mountain Times for covering such a great cause. It was a great article and I hope you continue to cover this very important cause. The whole world needs to be made aware of the type of employer Jennifer Allen is. Just in case some have not heard, I got wind that the security people she hired were carrying guns that were seen by people. Imagine that!! She has no clue how damaging that was on her. ROBIN, I want to thank you for such a great job covering the macs picket!! Well done! I was booted from the group for voicing my opinion. If your opinion isn’t nasty towards Allen, and you voice it, you get booted. It does not matter if you agree with the boycott or not. There are members of this group that treated me the same way Ms. Allan treated her employees. Isn’t that a doubled standard? They are fighting to respect and being treated fairly, yet they them selves do the very same thing that they are fighting for. I joined the group because i do believe in the right to protect my self and that if my family if the need arises. Yet I get booted because I refuse to be down right nasty to anyone. Good luck with your boycott. Good day La…… your comment is not true as I am one of the 2 administrators of the group and only we have the ability to remove you. You removed yourself from the group for an unknown reason. We ask that everyone in the group remain level headed and respectful to all other members. There have been 3 people removed from the group since it began and each one of them violated requests. 2 were because they placed posts in the group and then deleted the threads because people gave input they did not appreciate. The 3rd person was removed when they repeatedly made negative and confrontational comments. The one bad side about Facebook groups is once you remove yourself from a group it removes all of your posts……… including the post in which you stated that you were leaving. I hope you have a good day and try to post accurate information in the public domain in the future. I did not dismiss you and would never so I am not sure where this came from. You are right you also have to have your opinion no matter what..So I am sorry that this has happened. Perhaps I am not seeing the whole picture. Thank you for writing this article. I am proud to say I am a member of the group this article is about. This article hit it spot on! Thank you for bringing this situation to greater light. I hope more people stand up for what it is right and how we don’t need employers like her in this town. Wait a minute! This article is not fact based. It’s filled with innuendo and allegation! Here are the facts; this man quit his job. He was not fired. Sounds to me like he was reprimanded for violating company policy and didn’t care for it, so he left. What does his status as a vet have to do with that? Or, his medical bills? If he wants to pay his doctor bills, he should not have quit. Everything else in this article is subjective speculation and unsubstantiated allegation. Seems the protesters don’t think Ms Allen has the right to rent a U Haul and park it wherever she likes or control the sound of her speakers. She should be made to park the U Haul elsewhere. I find id difficult to believe that people standing apart from the store are having a hard time communicating with each other. I feel for this man…but he should not have quit his job. Perhaps, if he had stayed and put his energies into working according to the policies of his employer, there would be no need for a protest? Yes, this is true on many levels, however, If He did follow that policy, He might be dead right now. Not a very good trade off. Have you ever been confronted by an Armed robber? 2ndly, All of what you perceive to be innuendo and allegation, Are actually backed up by the people who have personally witnessed them. I have talked with these people, and seen some of it myself. The problem is that it can be difficult to put your name on something that you know will have a negative effect on someone whom has no problem calling your boss about anything you say. That is intimidation, and unfortunately, it works. You are entitled to your opinion and I respect that. Though I believe that if you had the opportunity to talk with the some of these folks, and seen what I have seen, you would probably join the group. It is very difficult to get over a thousand people involved in something that is unjust. I feel very strongly on this issue not because Don broke policy and got reprimanded but the way Don says she treated him is EXACTLY the way she has not only treated MYSELF but I have also witnessed her treating A LOT of other employees like that. Yes he broke policy, yes she accused him of lying several times about the events that took place, yes she refused to tell him how she was going to prevent more robberies from happening in that store, yes she refused to tell him how she was going to protect her employees, NO she did not thank him for saving her money, NO she did not ONCE say she was glad he was alive, NOT once did she give any positive feedback on the situation. Things SHOULD have been dealt with differently. Jennifer Allen is a straight up woman with power and money. I am a very strong woman and she was NOT able to knock me down before I told her to take her disrespectful attitude and lack of employee care somewhere else BUT I have seen her put MANY MANY employees in tears. I’ve seen her fire employees for eating outdated food and/or receiving free products from vendors. BUT turn right around and let another employee give away free food to truck drivers because she “trusted” this lying employee because he had realized all he had to do was be her little “rat” and he got to keep his job. Time and time again I have seen this woman pick and choose who has to follow policy. If she was the type of woman to make EVERYONE follow the same policies then this whole thing would have been different BUT I know for a FACT that she is NOT fair across the board. She is NOT a nice woman to work for and she degrades her employees all the time. I joined this group to stand up for MYSELF and the many many many employees I watched her put into tears, degrade, fire or force them to quit. I will continue to spend my dollar elsewhere and i will continue to have NOTHING nice to say about Jennifer Allen as with my 1 1/2 years experience with this woman I saw someone who has NO CARE in the world for ANYONE but HERSELF. Good day “Purple Phantom”. please note you can see my real name above as I am not afraid to let you know who you are talking to. Our group staged a perfectly legal informational gathering in a public area. Ms Allen took steps to interfere with our ability to do so which serves as an example of her underhanded techniques. It also tells us that she is very concerned about the truth getting out. At the first gathering we simply handed out flyers and spoke to people that were willing to talk. NO ONE on her property was approached by our group, I can say however that several customers did approach us to talk. Some supported Mac’s and more interacted with us and requested the flyers we were handing out. The acts that she is undertaking simply make us more determined to go to her other stores and spread the word. She is unwilling to take steps to provide a safer work environment for her employees or treat them with more respect but she can spend money foolishly at a peaceful informational gathering. You may ask how she spent the money? 1. Hired GUNS by contracting with the Sheriffs Department at each gathering. 2. Installed a security camera system directed at the sidewalk. 3. Rented 3 large U-Haul trucks to serve as barricades to prevent factual information to those that MAY have asked for it. 4. Installed a sound system directed at the sidewalk to interfere with conversations taking place, this certainly was not installed for the benefit of her customers. By the way, you may notice she hired people with guns to protect her business from people who announced their peaceful intentions. I find it appalling that she won’t allow her employes the same level of protection when alone in a store at night with access to all the cash that thieves know is available to them. It is fact that she has gone to several employers and spoken to them about about their employees being members of the group. She has threatened to pull contracts and is interfering with peoples 1st Amendment rights out of the workplace. I have personally spoken at length with one individual she approached and berated in their workplace. And yes, their were many witnesses to this act. This woman is out of control and I for one will stick up for people I don’t know who are treated with disrespect, some people think because they have money they have the right to demean and disrespect people. That is not how employees should be treated, we intend to help her see her errs and to change her practices. By the way Purple……Don was not offered any type of discipline from Ms Allen. He asked her if he was going to be fired after 40 minutes of being berated and being called a liar. She refused to give him any type of a definitive answer. At that point anyone with any dignity whatsoever would have quit and moved on. I would have done the same thing and I have to believe most other people would also. If Ms. Allen did not care of this boycotting site she would have never gone through the whole renting uhaul installing cameras etc for one day….let them walk on the public side walk…if she is in the right she wouldn’t care, but NO she really does but it is too stubborn to admit it. IN my opinion Ms Allen looks like a fool. Keep calling people’s employers and trying to get them fired because she would do it to hers. Very well written article. Looking forward to seeing them cover the next protest. Keep up the good work….it’s working!!!! Sounds like you are someone that doesn’t want to stand up for yourself – you have to hide behind a false name to act like a coward in order to make a comment! The Dark Princess brought me into a meeting to terminate me and I was well expecting that, she had Mary set the appointment up Monday for that Wednesday, Mary called back Tuesday to confirm I would be there Wednesday, Mary called Wednesday morning to confirm I would be there that afternoon! The appointment was set for 2 pm because I had to take time off from my regular job and I had a medical appointment at the hospital that afternoon and this too was conveyed to Mary – that office understood I was in a time constraint AND they verified it twice after already setting up the appointment! When I got there at 1:55 pm I was brought into the conference room and left there waiting for 26 minutes while Jen and Kelly were in the next room – I heard their conversations – it was a joke to them! When Jen finally came in and introduced herself I honestly thought I would be out of there in less than 5 minutes – “Sorry but you violated company policy, this an “At Will Employment State” so we are going to have to let you go for violating policy.” (I wasn’t even looking for a thank you!) And that is all I was expecting – done and over with – but this was not the case! So whoever you are – your cowardliness does not surprise me at all !!! Come out into the light and lets have a face to face and be prepared – I will gladly have most of her previous employees there with me and I dare the Dark Princess to call all of us a liar AGAIN in PUBLIC! It was a termination interview but she had another agenda for some unknown reason and she just kept on going and going about the video calling me a liar and when I asked what she would do about providing some type of security her answer was “The cameras were enough” REALLY??? I suggested adding a second person or a security guard for the last 2 hours and she rolled her eyes so I said it was because it would cost you money and that’s why you wouldn’t do it! I did try to stay and work things out – she wasn’t going to allow that with the constant attacks! I NEVER QUIT, After 20 minutes of her belittling, berating and attempt to humiliate me trying to make me feel like I should apologize to the robber because I was to aggressive to someone holding a knife to me and threatening me, I got up and headed to the door. She asked if this meant I was quitting, I told her that this was a termination meeting and she could take this any way she wanted – I was brought here to be fired and she did everything but so I had to go because I had an appointment at the hospital I had to be at – she followed me to the door and as soon as my heel was out she SLAMMED the door like a little child throwing a temper tantrum! She rented at least 4 u-haul trucks, if they were for some Bonafide use, she could have parked the 3 largest ones in the other parking lot with the smaller truck and where the SHERIFFS were parked! Why the NEW Speaker System? Why was it soo loud that the reporter even mentioned she had a hard time hearing any conversation because of her volume? I hope she does that again, I will make sure the police are contacted for disturbing the peace! Who ever you are, you sound just like Jennifer – too much money and brought up with a silver spoon in your mouth and NEVER had to work for anything in your life! Life is not fair and you have to do what ever it takes to make things work – it’s obvious you have never been down this road! I am more than capable of getting another job – but riddle me this, why did Mary and Kelly try to get me to become a Manager just months ago when I was working in Center Rutland if I was such a bad employee??? When Bonnie told me how she was treated I thought it must be because of Bonnie’s personality, but when I was leaving – all I could think was that my ex-manager was right – this woman is a lunatic and out of control ! I say “Kudos” to the Mountain Times for the unbiased reporting and not to allow themselves to be intimidated by The Dark Princess! Robin had to work over the excessive noise that was coming over the speakers (even motorists complained from the roadway!) and I think she did an excellent job of reporting the truth and she put it together in an enlightening fashion that is very interesting and I am proud that the Mountain Times published it for all to see what an out of control person is selling gas, snacks and fuel!!! Again, I never quit – I walked out of a termination meeting!!! Robin did an amazing job covering this story and really highlighting the issues at hand. I do not see any “subjective speculation” or “unsubstantiated allegations,” but then again – I am not an attorney like Ms. Allen is. Excuse me??? where do you get your facts from? OMG Purple Phantom whoever you are. You do not have a name to go with that hide behind phantom name if you will? You know ignorance is “bliss” and you need to read and re-read what Don and the others have said. Perhaps you missed a few paragraphs? Hmmmmm where do you work or do you even work? your claims are misguided and quite frankly ignorant. I cannot accept your comments as they lame with nothing to back them up….I wonder who you really are? And so what you are saying is that any and all employers have the right to speak and treat a “human being” any way they seem fit? REALLY? are you a lawyer? I asked the question before. Haven’t we evolved as humans in this century YET to forgo treatment of others simply because you have money? Sounds like the government…Oh did I say that? Read what we all have to say before you go defending this person….Money isn’t everything pal or gal who knows but stop because folks like you and Ms. Allen are the reason we are still oblivious to knowing our rights as humans. God we need to get past the mentality that “employers” have the right. WE ARE ALL CREATED EQUAL no matter what you think purple person/ms allen. She has the right to build a million walls or have 100 u hauls. Who gives a damn. She is trying to block people from telling the truth and well she has done exactly that with you. I think that no matter what is said…some people will NEVER get it…. It is very bery encouraging to see a local publication such as the Mountain Times doing the work of an actual news outlet. Reporting on things like this that the wider array of state media will not touch. Seems that anything having to do with firearms is taboo. Asking folks to close a store solo in a part of the state that has had dozens of robberies of convinence stores recetly is mind blowing to say the least. This is what is being protested. The treatment of employees. Mrs Allen has every right to have a policy in her stores, Then again her employees have every right to safety and security. I do not expect my first reply to post – too long! Purple Phantom is unable to use their real name because she is afraid of whom? It must be Mary, Kelly or Jenifer herself. Jennifer did not want to work anything out – I did stay and try, otherwise she would not have treated me like I was the robber. She has a reputation of doing what she did to me and there are many on our page to back that up and that also includes Bonnie my former manager! I did not expect to stay employed after that night and had another job all lined up before I went to the “Termination Interview” As for what does being a vet have to do with it, your comment shows a complete disrespect for all of us and if you can’t respect a vet then you probably don’t respect your own family! There is no speculation in the comments we provided – that is exactly why you seem to be someone from her office and if you are then you should have heard the same treatment to every person she has badgered to the point they walked out or put into tears because of her treatment. She get her way to include stalking previous employees to their new job – I personally know several that have had this done to and she did it to me as well! I do hope you are not too far off the ground when your bubble bursts – Jennifer will not catch you and the cold hard landing is going to hurt! I haven’t been able to respond to this article before now due to problems with my pc, but I do so want to take this time to thank the Mountain Times/Robin Alberti for the wonderfully written article on the Boycott of Macs. I find it very informative and very well written. I will continue to support this Boycott of Macs, but more so I support Don & any other employees that Ms. Allen has mistreated. getting fired for having a gun in the store is totally acceptable. everything that happened after that is insane. im pretty sure jennifer allen is breaking some employment laws by trying to get her former employee fired from a new job. usually when one checks references with a former employer, all they can say (assuming it was a poor relationship) is that the person worked for their company from x date until y date, and possibly what their pay is (not even sure thats allowed). what i really dont understand is why she acted this crazy in response in the first place. im not a gun nut, but if i owned a store, and my store got robbed and my employee stopped them by drawing a gun while i still might fire them (against policy) id still thank them for their efforts and help them find and even better job. especially if they didnt even have to fire their weapon to prevent the crime. and closing shifts at any joint that handles cash, there should always be more than one person working.